"At the heart of the Catholic character of a school are the Catholic hearts of those who work in the school, principal, teachers, chaplains and other staff " (The Catholic Education of School - Age Children NZ Catholic Bishops Conference 2014). Studying a paper called Identity and Mission by Lyn Smith through the Catholic Institute of Aotearoa New Zealand, drew my attention to the importance of the whole staff understanding their role when working in a Catholic school. The whole staff includes everyone our children and families come into contact with: our office staff, teachers, teacher aides, caretakers and cleaners. They are all equally as important as each other. Although not all of our staff are Catholic, just like our families, all staff members sign an agreement to support the Catholic character of the school. Job descriptions and copies of guidelines, explain expectations for employees. How often do we go the extra mile and support staff to understand the traditions, rituals and Catholic culture of our schools? I remember returning from an Ash Wednesday mass and a caring support staff member, drew my attention to the smudge of dirt on my forehead. We laughed and I briefly explained that the cross on my forehead represented the start of Lent. Our children need to be supported to grow their Catholic faith in an authentically Christian environment where each and every staff member understands that the 'ethics of the school are rooted in Gospel values and the teaching of the Catholic Church' (Christ at the Centre, The Diocesan Schools Commission, 2005). 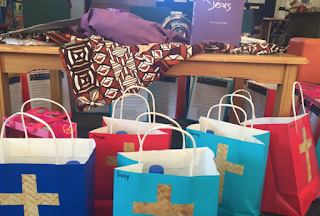 In 2015, we welcomed all staff to the new year by presenting them with "well being bags". 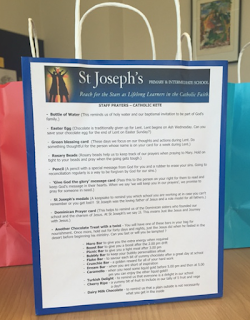 We ensured there were some prayers and links to our Catholic character but the main focus was on staff well being. Light the candle, bless ourselves and begin with this Lent video (from the Education resource page on the Catholic Diocese of Dunedin website). Present the Catholic Ketes and ask different staff members to read a sentence from the list of contents. Our Catholic Ketes around the prayer table in the staff room. - Another Chocolate Treat with a twist - You will have one of these bars in your bag for nourishment. Once more, hold out for forty days and nights, just like Jesus did when he fasted in the desert before beginning his ministry. Can you last or will you be tempted ? pm you can enjoy the other liquid gold!! God of goodness and mercy, hear our prayer this lenten season. Let us be honest with ourselves as we look into our hearts ad souls, noticing the time we turn away from you, then seeking to repent and return to your love. May humility guide our efforts to be reconciled with you and live forever in your abundant grace. Amen. Share other Kelly resources available for staff to loan: Rediscover Catholicism, Rediscover Jesus and explain about the daily email reflections from Dynamic Catholic during the forty days of Lent. 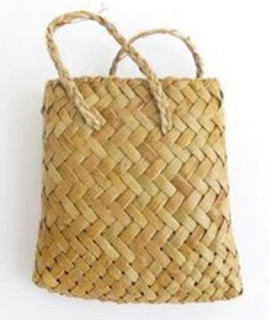 Let's support all of our staff to understand more about the Catholic school they work in and the role they play in creating an authentically Catholic environment where we "help to form Christ in the lives of others" (John Paul II quoted in Catholic Education of the School-Age Children, NZ Catholic Bishops Conference, 2014). We are so fortunate to work at a school where we are all supported physically, mentally and spiritually. Thanks for your awesome input and support Mrs Dooley. Together we support and encourage each other to be the best we can be.